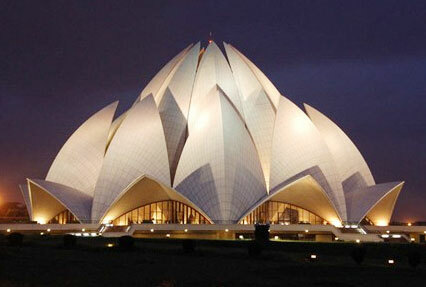 Golden Triangle tour offers a perfect introduction to the country by covering three important places of India. Visiting Pushkar, which is famed for its Pushkar Camel Fair is an added plus. The 7 days and 6 nights tour package gives you a chance to admire the brilliant architectural skills along with traveling to a pilgrimage site which is considered as a must-visit destination at least once in a lifetime. So hurry up, pack your bags and get ready for a tour that will give you memories to be cherished forever. Upon arrival at Delhi airport, meet our tour representative who will help you with guided transfer to the hotel. Complete the check-in formalities and relax. Delhi – Delhi remains in the bucket list of everybody planning a trip to India. A number of places to visit make the capital territory a favorite destination. The imprints of various dynasties are clearly apparent here. Start the day with a hearty breakfast. Post this, get ready to explore the attractions of Delhi. You will be visiting India Gate, Raj Ghat, Lotus temple, Humayun's Tomb, Qutub Minar and the Parliament house. The evening is reserved to enjoy the light and sound show at the Red Fort. India Gate – With the names of nearly 13,300 servicemen inscribed on it, the 42m tall India Gate is a war memorial. Raj Ghat – Dedicated to Mahatma Gandhi - the ‘Father of Nation’, the black marble platform highlights the place where Gandhi Ji was cremated. Humayun's Tomb – The tomb was built by the wife of Humayun in loving memories of his husband. It is the first garden-tomb on the Indian sub-continent. Qutub Minar – One of the iconic attractions of Delhi, Qutub Minar is the tallest brick minaret in the world. Red Fort – One of the architectural marvels of the Mughal era, the Red Fort was constructed using red sandstone. Enjoy a road trip to Agra early in the morning. After reaching the pre-decided hotel in the city, check-in and unwind for a while. Later on, get ready for Agra city tour. Throughout the day, you will be covering top-tourist places like Agra Fort, Dayal Bagh, Jama Masjid, Mehtab Bagh, Chini Ka Rauza and Ram Bagh. After this, head towards the Taj Mahal and admire its beauty. 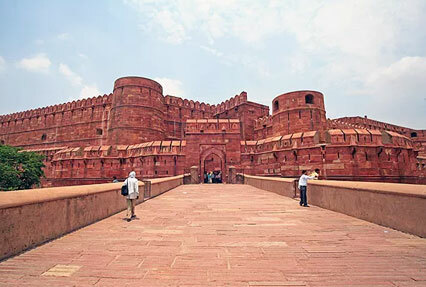 Agra Fort – Nestled on the right bank of River Yamuna, the Agra Fort is huge fortification encompassing entire city within its walls. Jama Masjid – The Jama Masjid is one of the largest mosques in the country and is especially visited by the devotees on Friday. Taj Mahal – One of the Seven Wonders of the World, the Taj Mahal is a white-marble mausoleum which epitomizes love of a husband towards his wife. Savor a hearty breakfast in the morning. Thereafter, get transferred to the Jaipur. On reaching, check-in at one of our listed hotels. A guided sightseeing tour to Jaipur is scheduled after resting for a while. The day trip will include a visit to the Jaigarh Fort, Hawa Mahal, Jal Mahal and the Nahargarh Fort. Jaigarh Fort – A paradise for history buffs and architecture lovers, the Jaigarh Fort showcases brilliant skills of the artisans of the bygone era. Hawa Mahal – Also called the Palace of Winds, the Hawa Mahal boasts of a distinctive five-storeyed exterior with 953 small windows. 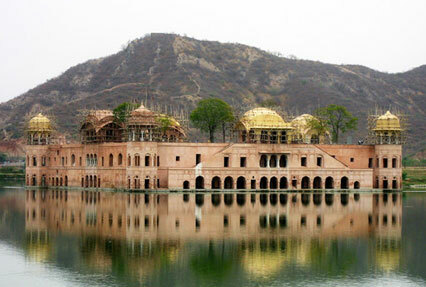 Jal Mahal – Once a shooting lodge of the Maharajas, the Jal Mahal or the Water Palace present a sight to behold. Nahargarh Fort – Nahargarh Fort enthralls with the panoramic views of the city. An interesting legend about the spirit of a prince is associated with the fort and amuses the visitors. Day 5 of the Golden Triangle with Pushkar Fair tour starts with an excursion to the Amer Fort. Delight-in a ride on the elephant. Spend rest of the day, visiting other best places of Jaipur like the Royal Observatory, City Palace, Central Museum and Birla Mandir, Sheesh Mahal and Sukh Mandir. Once done with exploring all the attractions, hit the road to Pushkar. Amer Fort – Inscribed as the UNESCO World Heritage Site, the Amer Fort is nestled on a hill. Overlooking the Maota Lake, the fort is worth visiting. City Palace – The City Palace features a complex which is so vast that it covers one-seventh of the walled city. Birla Mandir – Birla Mandir of Jaipur is famed as an architectural wonder of the historic and modern times. Sheesh Mahal – An elegant glass palace which represents the love of Rajputs for aesthetics. Sukh Mandir – A hall made up of ivory and sandalwood. An overnight stay is planned at the hotel in Pushkar. On this day, proceed for Pushkar sightseeing tour. Visit the Pushkar Lake, Apteshwar temple, Varaha temple and the Brahma temple. While visiting Pushkar in November, you can enjoy the Pushkar Fair which is a popular attraction of the sacred city and draws a lot of tourists from all over the world. 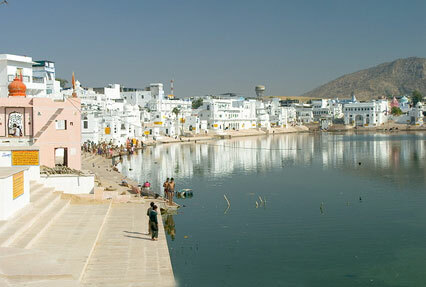 Pushkar Lake - The holy lake is a pilgrimage site for the Hindus and is bounded by many temples and ghats. Apteshwar temple – A perfect place to soak-in the spirituality. Varaha temple – Featuring stone carvings, statues and columns, the Varaha Temple is an ancient Hindu shrine. Brahma temple – One of the very few temples of Lord Brahma which is dedicated to the creator and destroyer of the world. Pushkar Fair – An annual cultural fete and livestock fair which lasts for many days. 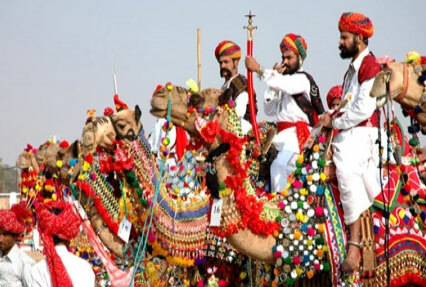 It is held in Pushkar in the month of November every year. This is the last day of the tour. You will be comfortably transferred to the Ajmer Railway Station to catch the train for Delhi. En route you can visit the Ajmer Sharif Dargah – a Sufi shrine and the most revered pilgrimage. After reaching Delhi, you will be guided towards the airport from where you can catch the flight towards your next destination.